Pat Mueller thanks her neighbors for coming out to celebrate the pavilion. Photo by Devi Shastri. It’s a warm, sunny evening in Martin Drive. Adults mill about the community garden as children dash through the crowd, playing a game of tag under a new pavilion. Dozens of locals gather for the ribbon-cutting ceremony to unveil a project that took months to complete. Mueller spearheaded the project as a way to address the garden’s need for a sustainable water source and a place for people to gather. It began when she and other gardeners feared losing their source of water after the city began charging to use the fire hydrant. The pavilion was designed by Reflo, a nonprofit dedicated to sustainable water solutions. The shelter is 200 square feet and has a 300-gallon cistern, which was full at the time of the ceremony. Andy Plier, Reflo’s director of project development, said the rain-harvesting pavilion is the second one designed by the group. The other was constructed at Guest House of Milwaukee’s Cream City Gardens. 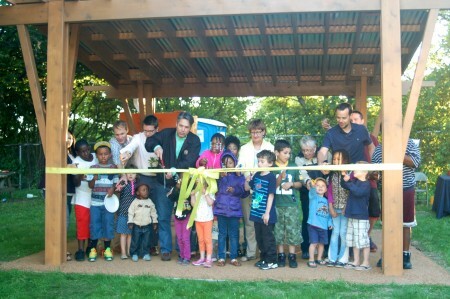 Funding for the pavilion was provided by the Greater Milwaukee Foundation, the City of Milwaukee Neighborhood Improvement Development Corporation and by donations to the garden collected through a Gofundme campaign. The City of Milwaukee provided the majority of the $10,000 required to build the pavilion, which was available to Martin Drive as a Targeted Investment Neighborhood. Vanessa Llanas, NIDC’s community outreach manager and a Martin Drive resident, worked with Mueller to make the project possible. Martin Drive residents also helped make the project possible. When Mueller needed to secure a permit to build a permanent structure, she got help from a neighbor who works at the Department of Transportation. Another resident, John Burke, volunteered to build the pavilion, which took two weeks. The owner of Amaranth Bakery and Café, David Boucher, donated the cistern. At the event, Alderman Michael Murphy, Rep. Evan Goyke and a spokesperson from the mayor’s office praised the pavilion and the Martin Drive community. As the sun began to set, children settled down on their picnic blankets with their parents to watch a movie projected on a screen hung from the pavilion. 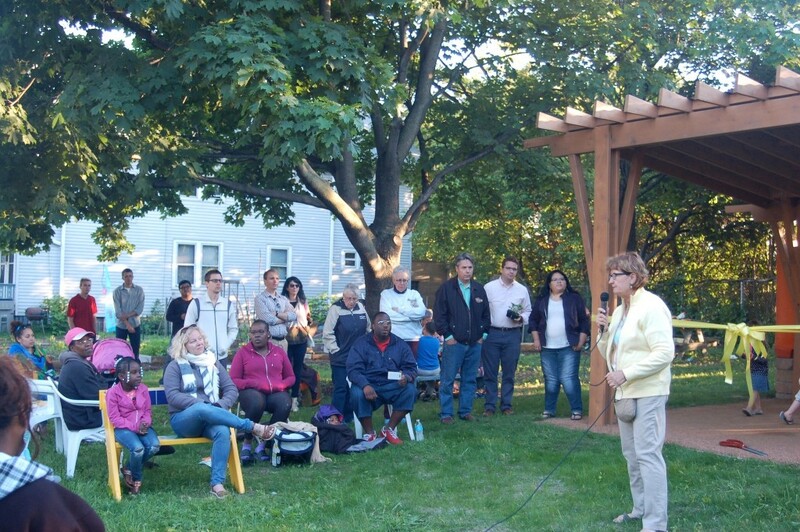 Falsetti spoke with teens about gardening techniques and Mueller chatted with neighbors. Martin Drive resident Shaniqua Madison sat in the grass with her children and nieces, enjoying the summer day. “I wouldn’t want my kids to grow up anywhere else but here,” she said.